There has been growing interest in light fastness test results for digitally mastered black and white printing processes. 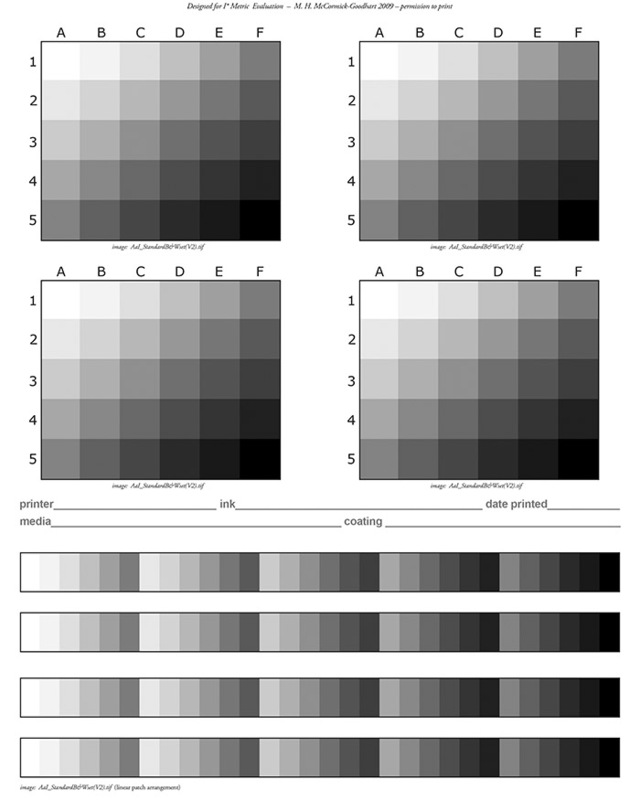 The I* metric can evaluate monochrome images as easily as full color images. One just needs to use an appropriate monochromatic image. In a sense, if we disregard material and process and simply think about the image itself, then a black and white print can be considered a special case of color. The new AaI&A test page for light fade testing of digital Black and White print processes. A black and white print still possesses color values. It’s just that all colors in the print have very little or no chroma, and when chroma goes to zero hue becomes undefined. If the print does exhibit a certain hue, for example, a sepia toned print, or a narrow range of hues (e.g., a split tone process), then the hue and chroma values in the print define a very narrow range of color but color nonetheless. An I* metric evaluation will therefore score both tone and color accuracy even for a “black and white” printing process. The new test file entitled “AaI_Blackandwhite_Print_Page(V2).tif” has been added to the testing.zip folder for AaI&A members to download. Additionally, I have updated the color target as well. It is now called “AaI_Color_Print_Page(V2)forSRGB.tif” and is located in the same folder. Lastly, sample documentation has been revised and streamlined (less work for members who submit samples for test). The new documentation file, “Sample_Documentation_READMEfirst.pdf”, can also be found in the testing.zip folder. Thus, everything AaI&A members need to submit either black and white or color print samples for light fade testing is now located in the testing.zip folder! The design of the new grayscale test image is fairly straightforward. Like the standard AaI&A 30 patch color target, the new B&W target has 30 patches to give it compatibility with AaI&A standard light fade testing procedures. The 30 patches are also laid out in a linear arrangement as well for better space utilization on some of the AaI&A test equipment, but the measured patch data are electronically reassembled into their correct rectangular image geometry when the I* metric evaluation is conducted. The 30 patches are deliberately arranged as a gradient step wedge that spans the full L* value range from 0 to 100. Although the file is encoded as a grayscale image, the embedded gray gamma 2.2 profile helps to ensure that the L* values will remain intact when translations of the target to an RGB or CMYK color space occur. This situation may arise when black and white prints, perhaps with desired tints or monochromatic hues, are rendered using full composite color printers. If you look carefully at the gradient tones in the 30 patch grid, you will notice that the image is shaded from pure white (L*=100) to maximum black (L*=0), and there is a shallower visual contrast diagonally in one direction compared to visual contrast in the horizontal and vertical directions. This gradient is carefully designed to exercise the full tonal range of the print process from pure paper “white” to maximum printable black density, and to do so in way that allows the I* metric evaluation to track subtle changes in tone (lightness and contrast) and color (hue and chroma) as the print ages in test. I look forward to our first round of black and white image fade testing.